Want to kick your PC performance up a few notches? A good liquid cooling system moves heat from the CPU more efficiently than air cooling and can run substantially more quietly. 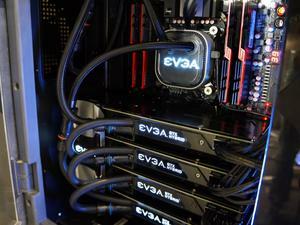 Many PC performance enthusiasts have used liquid cooling for years, and it's easy to see why liquid cooling is a popular performance upgrade. In the past, though, installing liquid cooling systems was not for the faint of heart. Once upon a time you needed to understand water blocks, radiators, pumps, and plumb. That's right: plumbing. High-end liquid cooling involved connecting tubing, ensuring that the tubing was properly sealed, and then filling up the reservoir with coolant. If you didn't achieve a proper seal, firing up the liquid cooler could lead to disaster, with coolant leaking all over your expensive PC hardware. High-end customized cooling systems are still the only way to go if you want to cool all aspects of your PC, including graphics cards and even hard drives. But if you just want a better CPU cooler, the new generation of sealed liquid coolers offers an interesting alternative that's usually superior to high-end air coolers. If you're content to run with the stock Intel or AMD CPU cooler that ships with your CPU, that's fine--unless your CPU doesn't include a CPU cooler at all. In the later case you can plunk down $20 or so for a standard fan/heat-sink combo, but your CPU will run a little hotter and the overall noise levels will be higher. For a little more money ($40 to $100), you could pick up a high-end air cooler. Most are quieter than a standard heat sink unit, but they tend to be much bulkier as well. And though they can be very efficient at cooling your CPU, some actually restrict airflow, particularly inside smaller midsize-tower cases. As a result of airflow restrictions imposed by a massive air cooler, key components such as graphics cards, drives, and even motherboard components may run hotter. Cue the sealed liquid coolers. These coolers contain a tiny pump integrated into the heat-sink module. The heat-sink/pump module is connected to a radiator via factory-sealed tubes, so you never have to fill or refill the liquid. A modest amount of liquid coolant circulates via the pump between the radiator and the heat sink. The tubing is both flexible and well-constructed, so it takes a considerable effort to break the tubing and spill the small amount of liquid coolant. The radiators are designed to fit into a standard fan mount (usually 120mm) on most PC cases. Fans attached to the coolers remove waste heat from the radiator. Note that some higher-end variants may support dual fans, improving airflow and cooling efficiency but also increasing system noise. Most models in the new generation of liquid cooling systems for CPUs are fairly simple to install. In fact, they're often less difficult to install than high-end, fan-based CPU coolers, since they're more compact and fit into a wider range of cases. The most common issues that arise during installation involve the case-mounted radiator module, not the heat sink itself. The two computers we'll use to demonstrate how to install a sealed-liquid cooler are Intel-based PCs, but the cooling systems support AMD-based systems as well, with only minor changes related to the mounting hardware. First, though, let's look at the two cooling products: the Antec Kühler H2O 620, and the Corsair H60. Antec's Kuhler H20 620 is an effective, relatively inexpensive sealed cooling system. The Kühler H2O 620 sells for around $60, though you can probably find it for a little less if you shop carefully. Its designer, Asetek, is also responsible for the Intel RTS2011LC liquid cooling system. The round heat sink module mounts into a ring-shaped retaining bracket. The heat-sink/pump module is round, as are most other Asetek-based designs, with a ring-based mounting setup. The Kuhler mounting hardware: The square piece attaches to the back of the motherboard. The included bag of hardware contains different mounting plates, suitable for installing the cooler onto an Intel or AMD-based motherboard.